In 1539, a proposal for a joint border demarcation commission to establish the border between the Ottoman Empire and the Polish-Lithuanian Commonwealth was sent by Ottoman sultan Süleymân to Polish king Zygmunt I. By 1542, the issue had boiled down to a dispute over whether the border should extend between the Dniester river and the Pivdennyy Buh river along the Sawran river (Ottoman proposal) or along the Kodema river (Polish proposal). 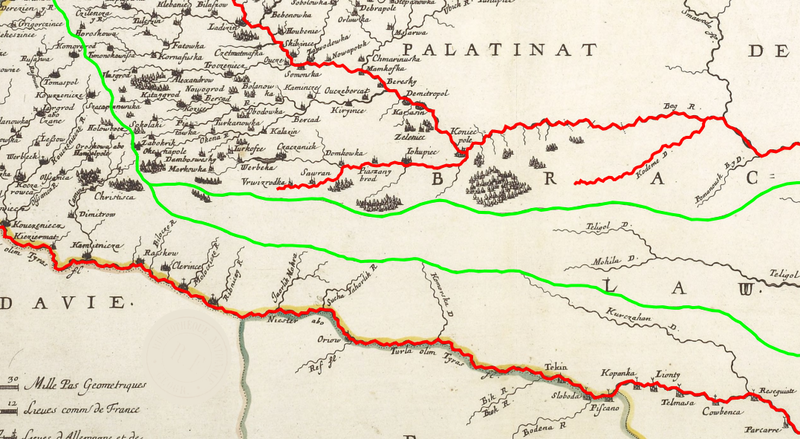 While detailed period accounts of the negotiations exist, the purpose of the SKBD project is to demonstrate how historical and modern maps can expand our understanding of the dispute by addressing questions such as: Where are the Dniester, Pivdennyy Buh, Sawran, and Kodyma rivers? How much territory lies in the disputed area? Are there any settlements, travel routes, river fords, or resources of importance in the disputed area? Ultimately, was this a struggle for control of a strategic resource-rich territory, or fundamentally a war of wills over a worthless plot of land?